Critical to a beautiful hardscape installation or masonry job is knowing how to do it correctly. But consider how many paver patios you’ve seen where the edges fail or the stones are so uneven that you could trip if you didn’t pay attention to every step you took. In a sea of poor and incorrect installations by inferior companies, Castle Point Landscape Design’s exceptional work stands out. ICPI and NCMA certified, our experts have the knowledge and experience to properly install all types of hardscaping and masonry, the first time around. 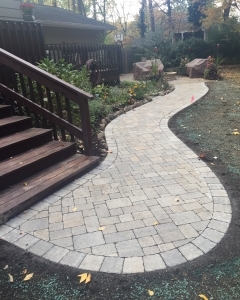 We excavate to the correct depths to support the interlocking pavement system at hand, and we use properly graded base material, the right edge restraints, high-quality pavers and polymeric stabilizer sand. Put everything together and you can rest assured that a hardscape or masonry installation completed by our team will last for many years to come. Paver Driveways, Patios and Walkways. Make a statement as guests arrive at your property, build an inviting patio or provide easy access to other areas of your landscape with custom paver driveways, patios and walkways. Our skilled team will work with you to select the best color, pattern and construction application for your unique property. Natural Stone Walkways and Patios. Add texture, enhance color and direct the eye, as well as traffic, with natural stone walkways and patios. Whether you want to achieve a rustic look or an elegant one, the Castle Point Landscape Design experts can help you achieve your vision. Segmental Retaining Walls. Stabilize sloping ground and boost property value with retaining walls. Our team can help design and build a wall that will make your landscape and home both safer and more beautiful. Garden and Natural Stone Walls. Create a long-lasting and elegant enclosure around your garden or other property feature by adding a stone wall to your landscape. We’ll work alongside you to select the best materials and then build a wall that creates a barrier while also adding a touch of sophistication. Fire pits. Enhance the warmth of your backyard getaway by adding a fire pit. This inviting addition will turn up the heat on your outside oasis for a warm and cozy atmosphere you can enjoy year round. Trust our expert’s flawless installations to liven up the allure of your outdoor environment. Castle Point Landscape Design has years of experience in designing and installing luxurious hardscapes and the elements that go into it. Hardscaping and masonry services are an easy way to add beauty and value to your home’s or business’s landscape. To schedule a hardscaping or masonry consultation for your Northern New Jersey landscape, call 908.512.2267 or email our team today.